Thanks to TV shows such as Deadliest Catch, Palin’s Alaska, Alaska Wing Men, and many Discovery Channel features, Alaska has received a lot of publicity over the years. The largest river runs in Alaska come from the Yukon River. In 2011, Yukon River Chinook numbers totaled just over 100,000. The popular Kenai River had almost 50,000 Chinook. Compare that to the largest river supporting Ucluelet, the Columbia, with 2011 numbers around 700,000! When you add the Fraser River, (reports haven’t been filed yet, but are likely around 200,000), and all the rivers around Vancouver Island, you have over one million Chinook heading past Ucluelet during the summer. This number far exceeds any place in Alaska. As well, numbers of returning Chinook have been declining in Alaska, and are currently at about 50% of what they were in 2002 for many rivers. In contrast, the Columbia River Chinook numbers are as strong as any time since 1950. One of the reasons Ucluelet attracts so many fish is the large amounts of feed that frequent the area. Directly out front of Ucluelet, there are a few major banks that hold bait fish, including herring, krill, pilchards, anchovies and squid. Chinook won’t stop unless there is food to attract them. 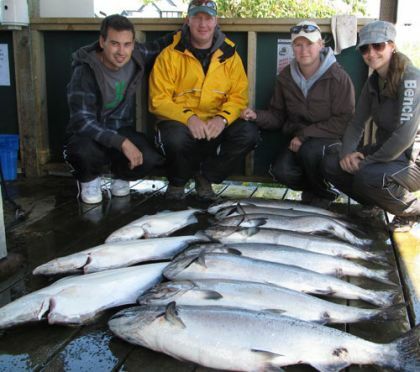 One more reason so many sport fisherman prefer Ucluelet is the length of the fishing season. Unlike other areas, where peak fishing is limited to a two week window, in Ucluelet there is good Chinook fishing from March to September. Because we don’t rely on just one river source for our Chinook, you can catch salmon all through the summer. Don’t just take my word for it, check out our picture blog with dates of our Chinook catches. At Salmon Eye, we believe good fishing, experienced guides, and great weather make Ucluelet the best salmon fishing destination in the world. 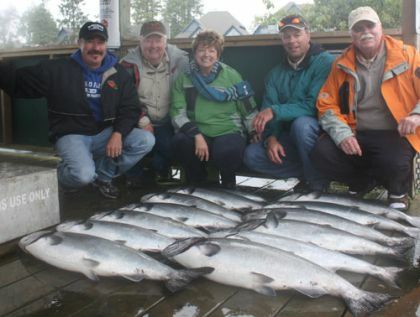 Although Chinook are most often the prized catch, Ucluelet also has fantastic Coho fishing. These fighting fish are fun to catch and great eating! Ucluelet is blessed with a much milder climate than the north coast of Vancouver Island, with noticeably less rain and wind. Ucluelet gets very little rain from June 15-Sept 15 and this makes any holiday that much nicer. The average day here also sees much lighter winds than both north and south of us. With strong numbers, a long season, and friendlier weather, we think you’ll agree that Ucluelet is the place for world class salmon fishing! For winter fishing check out our Victoria fishing page.